Hi everyone! Today is a very happy Wednesday, because I have a great post lined up for you today. You all know that I have a thing for energy bites, and today I'm sharing another version of my favorite treat. These delicious treats are so decadent and incredible- but they're Whole30 compliant! That pretty much makes them a health food, right? I love to make a big batch of these (this recipe will make two dozen) and grab a few when I can sense that rungry feeling coming on (which seems to be all the time now.) Is anyone else in that part of their training where you're hungry all. the. time?! Luckily, these are really quick and easy to whip up, and have been my saviour at work or before I head out for a run. They honestly taste like brownie batter, and I couldn't be happier with how these turned out. My sweet tooth and stomach are both very happy with this one! In a food processor, finely chop both nuts. Move to a mixing bowl. Add cocoa powder, coconut oil and instant coffee to food processor. Mix until well combined. Add dried fruit mixture to nuts in mixing bowl. Mix well with hands. Form mixture into balls or bars. Refrigerate at least 1 hour and enjoy! (I used a 1/2 tablespoon to measure out the dough and ended with 24 balls). What's your go-to snack to tackle the runger? What flavor combinations do you like in your energy bites? So much goodness in one bite! I need to try the cherry/instant coffee combo. I love both so I'm sure it'll be SO so good! Oh yum! These look delicious and so convenient! I love bite-sized foods that are easy to grab and go like this! These look so amazing! Definitely going to be trying these! What a yummy recipe! I love anything with dates. I bought dried cherries for the first time last year and fell in love! The mixture of the cherries and cocoa plus the hit of espresso would make these divine!! Aren't they the best?! I love this combination! Oh nice! I like how these have coffee in them. I need to buy a food processor. I used to have one but lost one of the main parts to it somehow. ARGH! These look amazing! I'll just send you my address and you can pop some in the mail, right? who doesn't want to eat brownies before or after a workout!? These have my <3! These look excellent! 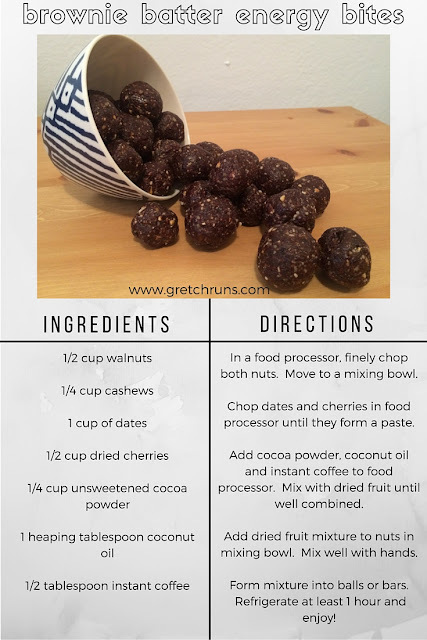 I have made my go-to recipe for energy bites at least a dozen times in the past two months... It might be time for something new. I hope you like them if you end up trying them! Yuuumm these look delicious! I love energy bites too. The ones I've been making recently are peanut butter and dried cranberries. I always love adding new flavors to them though! I've found them in different places in every grocery store haha! In Trader Joe's they're in produce, at my local store they're either with the cooking supplies (like where the nuts and stuff are) or in the dried fruit section if they have one. I always have to ask! Yum these sound good! 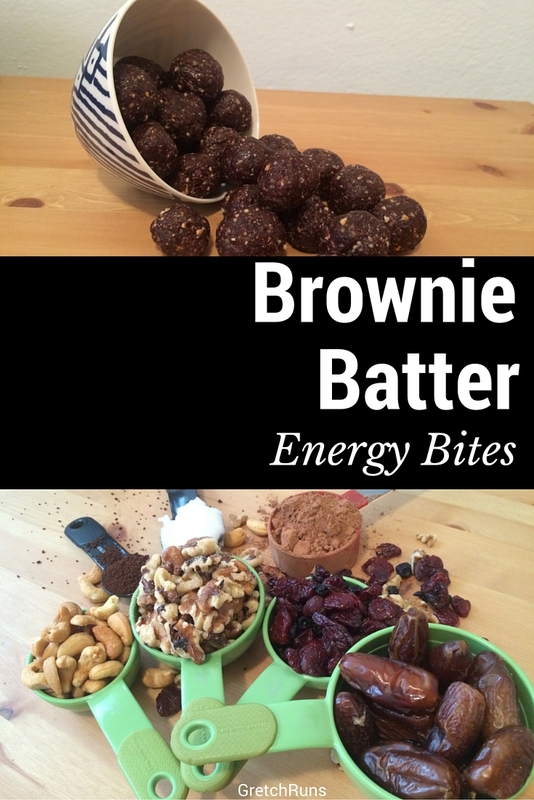 I need to start making energy bits/bars again now that hiking season is starting back up. Love the cherry addition! Pinning for later! These look so good-- I don't care for dates, which makes energy bars/snacks in general hard to find, but maybe I should give these a try! Thanks Carly! I promise that the other flavors completely overpower the date and I can't taste it at all. I'm sure you could substitute in another dried fruit or just use more cherries!